The do it yourself resource for homeowners from home improvement professionals. Use your screwdriver to unscrew the center screw on the top hinge. Remove the screw and replace it with a long 3-inch screw. Make sure you drive the screw into the framing. This should change the gap at the top of the door as well as on the opposite side. Place a nailset in between the hinge plate and the hinge knuckle and hold. Using your wrench, slowly bend the knuckles on the door side towards the door handle to close the gap. Use your screwdriver to remove all three screws on the hinge plate that sits against the door frame. Remove the plate and note where it has left an impression in the frame. Use a pencil to trace along the impression. With your utility knife, cut along the pencil line to make the mortise larger and accommodate the hinge plate. Use a small chisel to remove the excess wood so that your plate will sit flat. 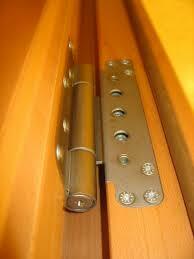 Use your screwdriver to remove all three screws on the hinge plate that sits against the door. Using wood plugs and a hammer, gently tap your plugs into the existing screw holes. Use a utility knife or a chisel to trim the plugs so that they’re flush with the door. Reposition your hinge and drill three new holes in the door. Reattach the hinge using screws and a screwdriver. Need help with this project? We have trained professionals that can help.